Sumita is the Technical Assistant & Chief of Staff to the Vice President of the Engineering Division of the Programmable Solutions Group at Intel Corporation. In this role she leads and drives multiple projects and solutions towards maintaining execution on technical programs, promoting diversity and inclusion within the organization and leading initiatives that drive overall success of Staff and the organization. Prior to this role she was a small form-factor strategist and technical assistant to a vice president in the Client Research and Development Group chartered with strategies around Systems in Package technologies and personal computing client device R&D. Between 2008 to 2014, she led the equipment installation and qualification program for Intel factories worldwide as a technical program manager in the Technology and Manufacturing group. She has worked at Intel, in positions of increasing responsibility, since 2002 when she joined the company as a Senior Process Engineer in the Portland Technology and Development Group. Sumita holds a Ph.D. in chemical engineering from Rensselaer Polytechnic Institute. Her dissertation work, conducted at the NASA Glenn Research Center in Cleveland, involved research in preparation of a microgravity fluid physics experiment for the International Space Station. 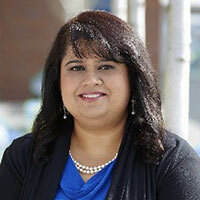 Within a few months of joining Intel as a senior technology development engineer, Sumita delivered the world’s first lead-free patterning process for Intel’s far back end bump technology (chip interface to packaging), enabling Intel to be the first semiconductor company in the world to restrict the use of lead and comply with European Union standards. During her six years in this position, she managed development of many patterning and plating processes and implemented numerous lean solutions for high-volume manufacturing. To deal with nanoscale defects, a critical issue in semiconductor manufacturing, Sumita created “The Defect Atlas,” an online repository of information about every known defect, its root cause, and material disposition criteria. The atlas made it possible to catch and characterize inline defects and to make the necessary changes to process flows. Inline defects for four generations of microprocessors were reduced and earned her the title, “defect czar.” She also drove the use of environmentally sustainable and cost-effective processing materials and devised a method for reprocessing patterned wafers multiple times without destroying the surface of the wafer or the pattern beneath. Her various lean strategies have saved Intel more than $2 million every year since 2004. When she was in high school, Sumita met Mother Teresa, an encounter that set her on a lifelong course of community service. She began by collecting clothing and food and raising money for Mother Teresa’s centers for homeless and abandoned children. Her current volunteer efforts focus on encouraging girls to participate in science, technology, engineering, and mathematics programs and on helping low-income students pursue non-traditional careers. In 2012, when the National Center for Women and Information Technology launched its pilot middle school outreach program in the northwest USA, Sumita volunteered to lead a team of engineers and colleagues in identifying 54 girls for an AspireIT award. This award enables girls to expand their technical skills. Now in its third year, the program has recognized 173 young Oregon and southwest Washington women. Sumita was also the chair of the executive board for the Women at Intel Network. Her generous donation of more than 2,000 hours of volunteer service earned her companywide recognition as one of the top five volunteer heroes in 2012. Dr. Basu lives with her family in Portland, Oregon. Her eclectic personal interests include watching action movies, making artistic cakes, listening to music, traveling, reading and entertaining with friends. “To talk about #WomenInTech is important, because we can empower the world to advance faster in technology development towards solving critical problems with more creativity, organization and brilliant leadership in a diverse and inclusive environment.